George Wigram Allen was born on 16 May 1824, Surry Hills, NSW, eldest child of George Allen and Jane nee Bowden. On 29 July 1851 he married Marian Boyce at Toxteth Park Chapel, Glebe. He died at Glebe on 23 July 1885, aged 61 years, survived by his wife, six sons and four daughters. Marian Allen died on 22 January 1914 in London. George Wigram Allen’s large family lived at Lynwood 1855-70, Strathmore 1870-81, and moved into Toxteth House in 1881 after it had undergone extensive alterations. He left an estate of 300,000 pounds sworn for probate purposes. Allen, articled to his father in 1841, and admitted as a solicitor in 1846, became a partner in Allen & Son. After his father retired in 1855 he subsequently entered into partnership with cousin Thomas Bowden, brother Arthur and son Reginald.. The legal firm, known as Allen, Allen & Hemsley in 1894, grew in stature. For 18 years from 1859 to 1877, Allen was chairman / mayor of Glebe, a long time to remain unchallenged as the dominant figure in local politics, perhaps an indication of the stability of Glebe’s ruling class. As MLA for Glebe from 1869 to 1882, speaker of the NSW parliament from 1875 to 1882 (knighted in 1877), he was one of the most respectable and powerful men in Sydney. Part of his great wealth derived from his role as slum landlord. Patronage for politicians at this time was a crucial cement in the system of parliamentary factions. Critics pointed out he had 60 relatives in the public service, opposed the eight hour day, and The Stockwhip argued he became speaker in NSW parliament because of ‘his wealth and the ability to give good dinners’. 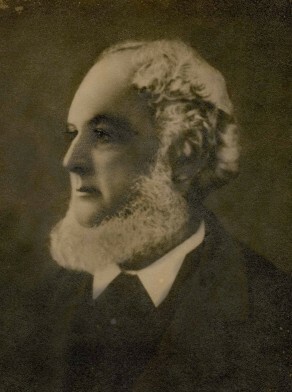 George Wigram Allen was a member of the Legislative Assembly for Glebe 1869-82. He was Speaker in 1875-82. He was knighted in 1877. At the opening of local institutions in Glebe Allen was fond of reminiscencing about his memories of Glebe where he lived at Toxteth Park from 1831 with a retinue of convict servants. At Glebe Free Library in 1880 he recalled the first Council meeting was in the long room at the University Hotel and after several meetings at James Pemell cottage in Parramatta Street, they rented a Glebe Road cottage of Robert Thrift from November 1859 as Council chambers. He recalled ‘The income was small, and an immense amount of work lay before them. The roads and streets required forming, they were almost impassable’. English author J A Froude dined at Toxteth House one evening early in 1885. He described Allen as ‘a man of vast wealth, one of the millionaires of Sydney. His house, three miles out of town, was like the largest and most splendid of the Putney or Roehampton villas. There was a large gatherng of distinguished people, legal and political magnates;ladies dressed as well, perhaps as expensively, as the ladies of New York … The cuisine would have done credit to the Palais Royal. The conversation was smart, a species of an intellectual lawn tennis which the colonists play well. There were as many attendants as you would find in a great house at home, with the only difference that they wore no livery’. Norman Cowper and Vivienne Parsons, ‘Allen, George (1800–1877)’, Australian Dictionary of Biography, National Centre of Biography, Australian National University, http://adb.anu.edu.au/biography/allen-george-1696/text1831, accessed 12 December 2013.